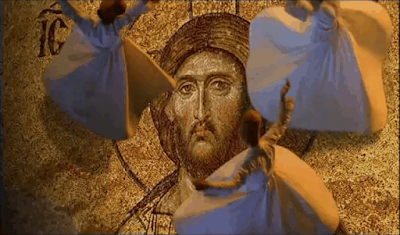 The picture above comes from a Turkish television commercial from 2006 that depicts swirling dervishes dancing on an enlarged image of Christ as depicted in the Church of Hagia Sophia in Constantinople. It continues to be shown on television in many countries. Do the Turks know no end to their blasphemy and intolerance! As I recall it was just this past May that more than 1,000 Muslims rallied in the city streets of Athens over claims that Greek police allegedly tore up and trampled on the Quran (which was never substantiated). They smashed 75 cars, injured 14 people, overturned trash bins and attacked banks. Left-wing Greeks were seen on Greek TV advocating on behalf of immigrants right to protest, saying: "What happened is a great insult to every Muslim, every immigrant and every Greek who respects democracy." What will these advocates say now that the Turks have added another entry to their long list of hypocrisies. On the one end we have Muslims protesting the Greek government for the trampling on the Quran, and now they go ahead on Turkish TV trampling on the face of Christ to promote their bigoted country. I wonder how Turks would feel if their Greek neighbors started doing a tsamiko or kalamatiano dance on an image of Muhammed? Or how about a Christian entering the newly built mosque in Athens wearing shoes? Such an act is nothing less than a death sentence. This is yet more evidence that Turkey is becoming more and more backward in a world that actually honors religious freedom and tolerance.